We’re proud to announce that we have just published the first two issues of a series of policy briefs on topics at the heart of the Ocean University Initiative. The first issue explains the role of Sustainable Development Goal 14 on the Ocean, while the second deals with questions about Marine Protected Areas (MPAs). Written by Anne-France Didier, Special Adviser for Regional and Local Governance and Co-ordinator for SDG14 at the French Ministry for the Ecological and Inclusive Transition, and Kumi Kitamori, Head of Division Green Growth & Global Relations at the Environment Directorate of OECD, this first issue has been directed by Laura Recuero Virto, our very own Research coordinator. This policy brief explains the role of Sustainable Development Goal 14 on the Ocean and points to the related major initiatives of the United Nations through a short interview with Vladimir Ryabinin, Executive Secretary of the Intergovernmental Oceanographic Commission. 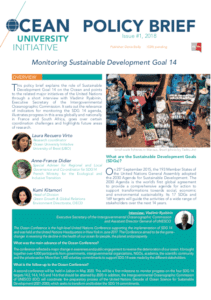 It sets out the relevance of indicators for monitoring the SDG 14 agenda, illustrates progress in this area globally and nationally in France and South Africa, goes over certain coordination challenges and highlights future areas of research. A French version was also released today. Recuero Virto, L., Didier, A-F., Kitamori, K., 2018. Monitoring Sustainable Development Goal 14 on the ocean. OCEAN University Initiative Policy Brief, Issue 1. Univ Brest, France. This second issue was written by Modou Thiaw, Coordinator, Fisheries Ecology Laboratory in West Africa (LEH-AO) (ISRA/CRODT and Universities of UCAD, UGB, UASZ) from the Dakar-Thiaroye Oceanographic Research Center (ISRA/CRODT) and Laura Recuero Virto. The problem of MPAs is not the lack of knowledge about the marine environment, but managing of people, that is, managing the different uses in these areas. Thus, it is much easier to identify MPAs than to manage them effectively, not only in waters under national jurisdiction, but even more so in areas beyond national jurisdiction. Another problem is not enough collegial and transparent scientific committees to ensure good scientific governance of MPAs. Recuero Virto, L., Thiaw, M., 2018. 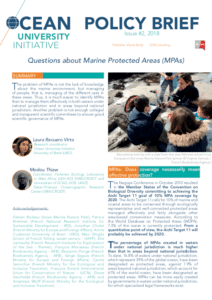 Questions about Marine Protected Areas (MPAs). OCEAN University Initiative Policy Brief, Issue 2. Univ Brest, France.